How, When and To Whom Do I Give Notice of my On-the-Job Injury? The Georgia Code says that an injured worker must give notice to his employer within thirty (30) days after his on-the-job injury. We advise our clients to give notice, preferably in writing, to a direct supervisor. The the sooner you give this notice the better. When giving notice to your supervisor you should be as clear as possible about the exact date and time you were injured and about exactly what happened. The more specific the better as we find that employers tend to question vague and uncertain reports about a work injury. Remember that workers’ compensation covers injuries “arising out of and in the course of ” your employment. This means that an injury incurred while you are on break, or coming or going from work may be challenged. Be suspicious if your employer’s workers’ comp rep tries to put words in your mouth about when or how your injury happened. 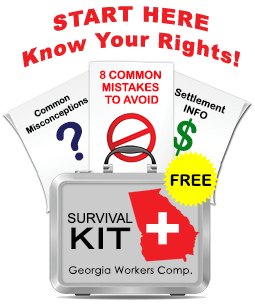 A quick word about the phrase “arising out of and in the course of employment.” The Georgia State Board of Workers’ Compensation spends a lot of its time listening to lawyers argue about what this phrase means. What you tell your employer about your injury, and what you tell your doctor can make a huge difference. For this reason, we encourage injured workers to seek legal counsel sooner rather than later. Once you report an on-the-job injury, your employer is supposed to write up a “first report of injury” and send it to both the State Board of Workers’ Compensation and to its insurance carrier. Not surprisingly, this does not always occur as employers try to avoid filing claims with their workers’ comp. carriers. Your employer may delay filing the required paperwork and may tell you to file with your group health insurer. They may suggest you file under short or long term disability for lost time from work. Do not let this happen as group health and/or STD/LTD carriers will not pay for either lost wages or medical costs related to a work related injuries, as workers’ compensation insurance is considered “primary” coverage. We have seen some situations in which the group health carrier initially accepts the claim, but later rejects it once the file is audited. This could leave you stuck with a medical bill that otherwise should be covered. What Can I Do if the Company Doctor Returns Me to Work But I am Still in Severe Pain? I have worked for my employer for 20 years. Due to the type of extreme work that I did, over a period of time I damaged my spine and was told I had 2 herniated discs, one in my neck, the other in my lower back. Both areas also have bone spurs. The first WC Dr. I went to told me I had a pulled muscle and sent me back to work Full duty. I had an MRI, which clearly showed the damage, but this Dr. chose to withold the results from me and off I went to work! Knowing I could not perform my job, but under the threat of termination, I did as instructed. I could not stay the day and left, got another WC Dr. and when he saw the MRI, he told me about the damage. I eventually had surgery on my lower back which has not helped very much and another MRI revealed that the disc is still slightly bulging hence the pain I feel daily. The “well known” surgeon, has chosen to release me to work on light duty and has changed his mind about my neck. Apparently he has decided that it is due to “age” (I am 45). He refuses to treat my neck and has become defensive and evasive in my dealings with him. It is like all of a sudden he is done with my treatment even though I am only half way treated. I am in constant pain and cannot do anything! By the way, my job was loading 8,000 pounds of freight a day, and this Dr. says it suddenly has nothing to do with 20 years of that! How can a Dr. turn on his patient like this? WC has been as unhelpful as they can be. I know the Dr. has been told by WC to end his treatment and get rid of me. What is my recourse? I am young, have a young family and can’t go on in this pain and do not feel that I deserve this lack of medical care. Jodi Ginsberg responds: Darryl, thanks for your question. In many cases if you are terminated while involved in a workers comp case, the termination can actually help your case. If you are terminated for no justifiable reason (typical reasons we often see include “disobedience,” “company policy violation,” etc..) and you are on light duty or no work status then your case is actually enhanced because the insurance company no longer has the leverage of finding a light duty job for, after which they could cut off your temporary total disability benefits. We sometimes see a situation where our client is on a light duty job that was created at the request of the insurance company, but the employer does not like the idea of having a non-productive employee hanging around and the employer ends up firing the injured worker. In such a case the insurance company then has to start paying temporary total disability benefits again because the claimant is no longer working. Where you potentially face a problem with your case is when you are returned to full duty work. If you have been released to full duty and are subsequently fired, then you will most likely have to go to court (the State Board of Workers Compensation) to get your benefits started. As you can see, your work status (full duty vs. light duty vs. no duty) is very important as is the timing of any termination. Unfortunately you have discovered the truly unpleasant side of Georgia workers compensation. I work at a job where I am using a computer keyboard all day long. Over the past few months, my right wrist started to hurt and get numb at times. I reported my injury on November 28, 2006 to the Human Resources Manager requesting for a keyboard tray from desk. The HR Manager told me that it was out of his hands and that I should order a tray through my manager for approval. I asked on several occasions for the tray and my injury started to become more aggravated, so I went to his boss asking him about the status of a computer tray. He told me that the tray was too expensive and I now needed a doctors note in order for me to receive a keyboard tray. I went to my doctor and told him the same story and he suggested that I file a workmen’s comp claim since it was a work related injury. It was filed the first week of February with the correct injury date of November 28th I am scheduled for surgery this Wednesday February 28th and they are now just informing me that I have to use my PTO to compensate my time off. Now, by law if I use the 21 days from the injury date (which it has been) shouldn’t I receive full compensation? Jodi Ginsberg responds: Alyce, thanks for your question. The law requires that you file your workers compensation claim within 30 days of the injury. Here it looks like your date of injury was November 28, but you did not file your claim until the first of February. Is your employer acknowledging that you “reported” your injury in November? For the benefit of anyone reading this blog, employers and insurance companies use these “reporting deficiencies” all the time to deny claims. If you get hurt on the job, you should always try to report the claim in writing and, if possible, file a report of on-the-job injury yourself with the State Board of Workers’ Compensation. By the way, if your injury did not “happen” on a specific day but was the result of months or years of overuse, then the injury date you choose is called a “fictitious injury date.” In cases involving these types of “overuse” injury, it is even more important for the injured claimant to file his own Form 14 notice on injury with the State Board.